The first session of the conference was titled Patience, Persistence, and Programming: Starting and Sustaining a Prison Education Program and featured three coordinators / directors from different programs. A unique aspect of this program is that it was started by undergraduate students. One aspect of her presentation featured the paperwork that was required of her to solidify her program and provide courses for academic credit. The university she is affiliated with required her to prove the university students’ safety who volunteered with the program inside of the prison. To do so, she asked a librarian for help with research to see if there was any information about violent acts happening upon prison volunteers. The librarian found no such documentation; the librarian then provided a statement on not finding any recording any incidents for Emily’s report. She also reached out to other prison higher education programs to see if there had ever been any incidents that have happened with their work; everyone said that no violent acts had happened to any volunteers. Emily then produced a document that featuring the lack of incidents to fulfill the university’s need of proof of safety. Barbara began her talk with sharing the many issues where we, doing work in prison education, struggle finding balance, such as – build it and they will come vs. build it to last; fly under the radar vs. show your achievements; provide intellectual courses vs. provide foundational courses; how much time spent in the prison vs. on campus; culture of campus and academia vs. culture of prison, etc. While these unique balancing issues exist, many of us face them and we need to talk about the issues to find methods to fulfill the needs of students and the mission of our programs. She also stressed that key stakeholders in prison education – inside and outside of the prison, supporters and those leery of the program – to know who to ask questions when you are in need. For example, how to create the logistics of brining flash drives in and out of the prison. Pros and cons: I had never heard of this model before, so I forgot to take notes on this section! But, this is how the Boston University Prison Education Partnership operates. Jennifer asks us: What is your relationship like with the university? What is your relationship like with the DOC? What are to pros and cons you face? A resource Jennifer suggested to all of us is Prison Study Project from Harvard which part of their project lists all higher education programs in the United States. I recently wrote about Glennor Shirley’s blog being down. As of yesterday, her blog is back and running! A big hip hip hooray for having access to the thoughts of this wonderful prison librarian! 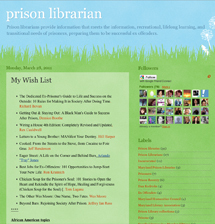 You can visit her blog, Prison Librarian, at http://www.prisonlibrarian.blogspot.com. UPDATE: As of July 26, 2012, Glennor Shirley’s blog is up and running again! Glennor Shirley’s blog was considered one of the top prison library blogs. Her blog, Prison Librarian, was located at http://www.prisonlibrarian.blogspot.com. Last week she lost all of her blog content and I’m not sure if she is trying to regain her content. The blog OLOS Columns: ALA’s Office for Literacy and Outreach Services featured Glennor as a guest blogger until 2008. You can read her past blog posts under the tag Services to Incarcerated People and Ex-Offenders. To read more about Glennor Shirley, read Words from Past Prison Librarians: Glennor Shirley. Here we continue our journey on looking into the perspectives of retired prison librarians. We previous looked at Frances Saniford and now we move to Glennor Shirley. 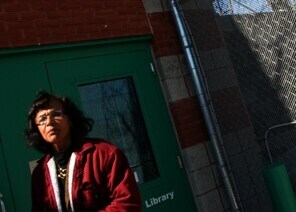 Shirley retired in September 2011 after being a prison librarian in Maryland for over 20 years. She has a popular blog that she still writes for called Prison Librarian. After coming to Maryland from Jamaica in 1980, where she was also a librarian, Shirley began her work in the prison library as a part-time night job to make ends meet; this job eventually turned into her career, which she considers a “happy accident” (Haldeman). She states , “I am basically a person who believes in justice and what is right. I saw these needs behind bars” (Rosenwald “Glennor”). Shirley claims “that her time as a prison librarian has been the most rewarding portion of her career” (Haldeman). Why should non-imprisoned support prison libraries and reading behind bars? Shirley was not foreign to this question: “She was often asked why taxpayer money should be used to make a prisoner’s life more rewarding. Her standard answer: She wants to help them become taxpayers again. Without an education, she’d say, that’s impossible” (Rosenwald “Maryland’s”). Haldeman, Annette, ed. “Glennor Shirley Retires.” The Crab: A Quarterly Publication of the Maryland Library Association. 42.2 (Winter 2012). 23-4. If you follow the link to find a list of her writing on page 24. Rosenwald, Michael. “Glennor Shirley, head librarian for Md. prisons, believes in books behind bars.” Washington Post 25 May 2011. If you follow this link, you can also watch a video of Shirley speak. Rosenwald, Michael. 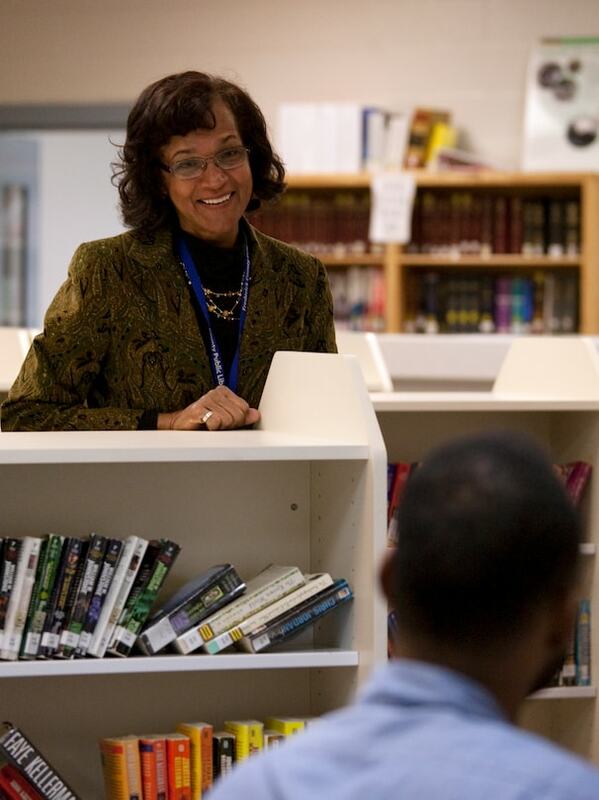 “Maryland’s beloved prison librarian retires.” Washington Post 9 Sept. 2011.